Nyjah Espinosa was killed by a pit bull-type dog while visiting her father's home. Pit Bull-Mixes Routinely Mislabeled "Bulldog-Mixes"
UPDATE 12/30/15: After a serious or fatal attack, there is rarely a "pit bull-mix" designation in Miami-Dade County, which has banned pit bulls since 1989. 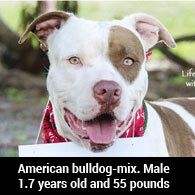 The labeling is either a purebred pit bull, where the ordinance must apply, or a mix that excludes pit bulls, such as the following assigned by Miami-Dade Animal Services after 3 recent fatal attacks: American bulldog-lab mix, American bulldog-mix (unspecified), lab-mix (unspecified) and terrier-mix (woefully unspecified). Three people have been killed by variances of Miami-Dade's "breed labeling game," primarily American bulldog-mixes, since August 2014. In a jurisdiction that bans pit bulls and pit bull-mixes, Miami-Dade Animal Services (MDAS) assigns these suspicious labels to a dizzying number of dogs available for adoption, many which should be in violation of the county ban ordinance. Also noted are the unrealistic weights of the three adult male alleged American bulldog-mixes, which show a weight common of an adult male pit bull, not an adult male American bulldog, which typically falls between 70 and 130 pounds. The first dog, Bruce, came into the shelter as an American Staffordshire terrier on Sept. 27, according to social media posts -- explicitly prohibited by the ordinance. 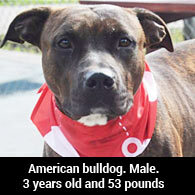 By Nov. 30, while still at the MDAS shelter, the dog magically became an "American bulldog-mix." On the second row, the first dog, Jonny, was admitted to MDAS as a "Pit bull terrier-mix" on November 2, according to social media posts -- also prohibited by the ban ordinance. 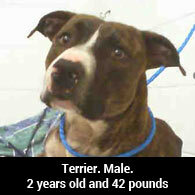 By December 14, it was labeled simply a "Terrier." 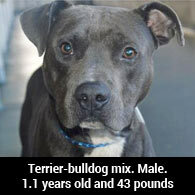 By December 22, Jonny magically became a "Terrier and bulldog" mix. The Miami-Dade County pit bull ban ordinance is quite clear. Pit bull-mixes are indeed included and specifically part (c) states, "Technical deficiencies in the dog's conformance to the standards described in subsection (b) shall not be construed to indicate that the subject dog is not a 'pit bull dog' under this article." MDAS is clearly assigning the pit bull breed designation by essentially using a "dog show conformation requirement," which is not what the ordinance intended. Furthermore, as noted above, some dogs like Bruce and Jonny were initially designated by MDAS as an American Staffordshire terrier or pit bull-mix, both prohibited by the ordinance, when admitted into the shelter. Then later assigned an American bulldog-mix or terrier-bulldog mix label by MDAS, designations that fall outside of the ordinance and allow the dogs to be adopted out to the public. The interchangeability of these breed labels is often just that: totally interchangeable. Sec. 5-17.1. - Definition and identification of a pit bull dog. (b) The Standards of the American Kennel Club and the United Kennel Club referred to in subsection (a) above, are attached hereto and incorporated herein by reference as "Exhibit A" and shall remain on file with the Animal Services Division of the Public Works Department of Miami-Dade County. (c) Technical deficiencies in the dog's conformance to the standards described in subsection (b) shall not be construed to indicate that the subject dog is not a "pit bull dog" under this article. (d) Testimony by a veterinarian, zoologist, animal behaviorist, or animal control officer that a particular dog exhibits distinguishing physical characteristics of a pit bull shall establish a rebuttable presumption that the dog is a pit bull. Section 5-17.5 of the pit bull ban ordinance designates MDAS as the enforcers. "It shall, be the duty and responsibility of all Miami-Dade County Animal Control Officers to enforce the provisions of this article," states the code. The very department that overly indulges in the "breed labeling game" to apply the ban to fewer dogs. This continues to be the case after the longstanding pit bull ban was upheld by the public in a countywide primary vote in 2012 by a 63% to 47% margin. As pointed out by Sputnik in our comment section, MDAS was formerly part of the Dade County Public Safety Department then shifted to the Animal Care and Control Division under the Public Works Department. In 2001, the Miami-Dade Police Department took over and in October 2005, Animal Services Department (ASD) was created as a stand-alone entity with the core mission of "caring for the animals in its custody." Any mission of public safety was purged 10-years ago. What do dogfighters and pit bull experts call their pit bulls? "Bulldogs." What were pit bulls mainly called prior to the 1970s? "Bulldogs." This is because "bulldog" in this context refers to the earliest bull baiters (bulldogs) crossed with terriers, to create the ultimate canine warrior in the dogfighting pit. These dogs became the modern day pit bull terrier. The American bulldog, formerly named the "American pit bulldog" is just another iteration of this early "bulldog" breed that is now extinct. The terms "bulldog" and "original bulldog" always mean the original baiting bulldog, of which several gripper breeds descended from. So when we asked expert Alexandra Semyonova for a breed identification of the dog that killed Nyjah Espinosa just 5-days from her second birthday, she said simply, "It's a pit bull-mix." Because technically, all American bulldogs -- particularly the Scott-type, the breed standard -- are at least half pit bull terrier. The AKC does not recognize American bulldogs and the UKC only began to in 1999. But why not hear this from the horse’s mouth, the "inventors" of the American bulldog? Read more about the 19th Century "original bulldog" on the Safety Before Pit Bulldogs blog. Since we began documenting U.S. fatal dog attacks, American bulldogs have always had their own category. They are tracked separately from pit bulls despite their mirrored heritage because they are formally recognized by the UKC. Since January 1, 2005, American bulldogs and their mixes have contributed to 3% (11) of the total 361 dog bite fatalities, including the two recent deaths in Miami-Dade County, where MDAS routinely over indulges in the "breed labeling game." Editorial note: After the August 2014 mauling death of Javon Dade Jr., MDAS used four different labels to identify the secondary attackers (a group of 5 dogs, which included puppies): Labrador-pit bull mixes, American bulldog-lab mixes, terrier-boxer mixes and terrier-mixes. After the fatal attack of Carmen Reigada in September, MDAS labeled the dogs and American bulldog, Rhodesian ridgeback and lab-mix. Later, the American bulldog was relabeled an American bulldog-mix and the ridgeback was dumped. 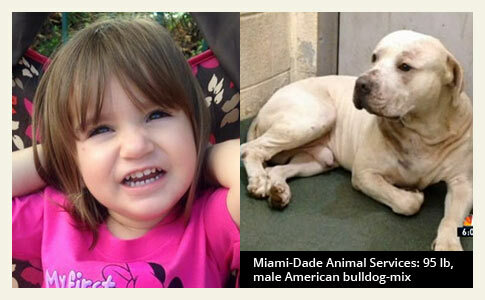 Miami-Dade, FL - On Sunday, a 2-year old girl was brutally attacked and killed by her father's pit bull-type dog while visiting his Miami-Dade home for the holidays. Nyjah Espinosa would have celebrated her second birthday on Christmas, but a 5-year old male "American bulldog-mix," according to Miami-Dade Animal Services, struck her down in a deadly attack. County officials say the little girl was in the hallway when the dog attacked. Police continue to investigate her death. On Nyjah's GoFundMe page, her grandmother, Diley Gonzalez, states: "On Sunday, December 20th, 2015, my granddaughter, Nyjah "Nyny" Espinosa, just 5 days shy of her 2nd birthday, was attacked by a pit bull. Doctors at Miami Children's Hospital tried to keep her with us, but were unable to do so. Our little girl was no longer with us." So, as usual in Miami-Dade County, animal services labeled the dog an "American bulldog-mix," but family members believe it is a pit bull. We have sent the dog photograph to an expert to review. 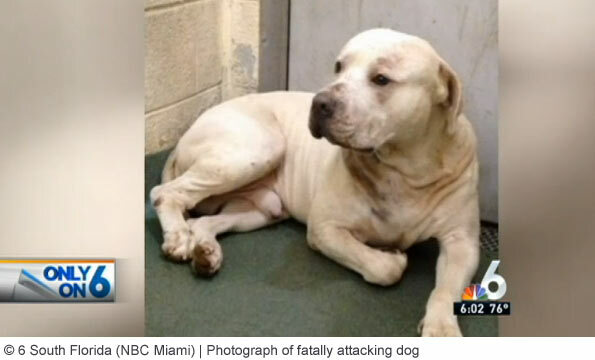 This case is not nearly as outrageous as the "breed labeling game" Miami-Dade Animal Services played after the pit bull mauling death of Javon Dade Jr. in 2014. 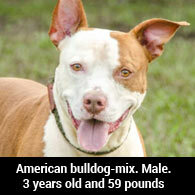 Miami-Dade County has had a pit bull ban since 1989. In 2012, the public upheld the ban in a county primary vote by a wide margin. The pit bull ban stands. The "enforcers" of this ban, Miami-Dade Animal Services, should be subject to extreme scrutiny at this stage. View the DogsBite.org Google State Map: Florida Fatal Pit Bull Attacks. 1In a 1997 interview posted online, Johnson boast about how his dogs are the original bulldog and that the "American Pit Bull Terrier got its gameness in the first place from the American Bulldog." Dogfighters would certainly dispute this! Johnson is simply one of many who want to take credit for "preserving" the "original bulldog." 2If we had proof of the dog's sire and dam, as we have had in other close call breed determining cases, most recently in West Virginia and Iowa, and in 2014, Louisiana, we might certainly change our mind about this dog. Parents are going to be jailed for not allowing their kids to visit family in court mandated visitation cases.. There needs to be acknowledgement of the public safety threats of these dogs so parents can deny visitation if a pitbull is present. Miami Dade needs to get sued by this mom and other victims as the government leaders are openly ignoring their responsibility to oversea animal services and make sure the laws are followed. They should not get a dime of their salaries as they are not doing their jobs. According to their own "About Us" page, Miami-Dade Animal Services was originally part of the Public Safety Department. In 2001, the Police Department took over. Then in late 2005 Animal Services was removed from police and made independent. Their stated 'core goals' are now: dealing with animal cruelty, "focused care for the County's animal population", "caring for animals in [our] custody", and "to reunite lost pets with their owners and find life-long homes for as many animals as possible, while providing proper care during their stay". Stop and think about this for a sec. This means that Animal Services is fulfilling its core function by obscuring the fact that this killer dog is a pit bull mix, thus protecting it from Dade's popular pit bull ban. If they try to reunite it with its owner or with some other life-long home, they will be doing what they are supposed to do. As the "About Us" statement indicates, Dade government has chosen to leave constituents without any agency dedicated to protecting the public from dangerous animals — not the Health Department, not police, and not this thing called 'Animal Services'. They handed what used to be Animal Control over to a crowd of pit bull fans, removing the public health and safety role as they did so. Miami-Dade Animal Services isn't supposed to protect human residents — it's officially supposed to protect the mauler that just grabbed your child. It's a sad state of affairs, and I hope Dade voters are soon outraged enough to put a stop to it. Agreed Richard. Any DBF is terrible, but I'm especially upset when I hear of them in locations with well-known pit bans. Whatever shelter/breeder whoever sold this dog knowing of the ban is responsible for this child's death as well as the person who bought it. Miami-Dade needs to be much stricter with their pit ban. No shelter should have pits for sale and they all need to be regularly investigated to ensure that they're not pushing any dangerous dogs out in the public. Anyone seen with a pit needs to be reported immediately. There is no reason for there to be any deaths by pit in an area with a pit ban. Richard and Bailey — Yes, the public needs to be outraged and demand enforcement. But this will be difficult as long as Animal Services is in the hands of people dedicated to protecting above all pit bull type dogs. It shall be the duty and responsibility of all Miami-Dade County Animal Control Officers to enforce the provisions of this article. You're right that citizens who look away and don't demand enforcement are guilty too. But the people with blood really dripping from their hands are first of all Animal Services and second of all lazy fat-cat politicians. The decisive voice of voters hasn't impressed Dade officials. It looks to me like the Dade ordinance does give room to sue the county for its deadly non-enforcement. I'm posting this information here in the hope that some readers will pick up on it and be encouraged to demand enforcement of the ban. But, if Animal Services don't acknowledge that it is a pit bull, then they don't have to do anything about it. They're saying it was a bull dog. No difference to you and I, but legally, if someone reported it, they could just play the name game and deny it's a pit. If Animal Services deny it's pitiness, then, even if the mom complained that it was dangerous, she would still have to let the child go there for visitation. Reporting does no good if the officials are protecting the dog. Its why I still see many pits here in Australia and combined with animal control and shelters that are blind (deliberately or not) to the reality of the pit type dogs then the owners just fly under the radar some having been told that the new pup they purchased is not banned because it's not a 'pit bull'. Meanwhile more kids and pets get hurt. If Miami-Dade found itself on the receiving end of some breed-specific LITIGATION, watch that breed-specific LEGISLATION. It will start being enforced to the letter. I'm sick and tired of this breed name game BS. Anyone with the slightest knowledge of dog breeds can tell if a dog has bully breed blood in it. 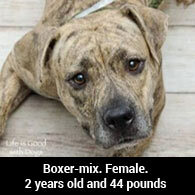 They know exactly what they're buying when they walk out a shelter with a bulldog/boxer/terrier mix labeled pit. The only time they try to hide it when it's inconvenient for them. I saw a woman on a dog forum who was talking about how she was going through the process of buying a dog from a shelter. She also mentioned frequently how she loved bully breeds and that's what she was looking for. Eventually she gets the dog that's obviously part pit. Oh, but once her neighbors start complaining of a pit suddenly the dog is a "lab mix" because "that's what the shelter called it". But once she's back on the forums, she and the other members are cooing about her "sweet, little pittie". Disgusting. Miami-Dade and all other shelters around the world that are mislabeling pits should be ashamed of themselves. As well as the people that knowingly buy them and try to hide their breeds with the stupid "mix" label. This is ridiculous and needs to stop. People first. We need the protection, not the dogs. I know way too many firefighters that say, if it looks like a pitbull, it is a pitbull. How is it that firefighters would have so much wisdom on this subject? Could it be that they witness first hand the horror and pain of pitbull domestication. If the bully was bred out, it probably wouldn't look like a Pitbull anymore.